Gray kitchens began trending after photos of Martha Stewart’s Bedford house kitchen were published. 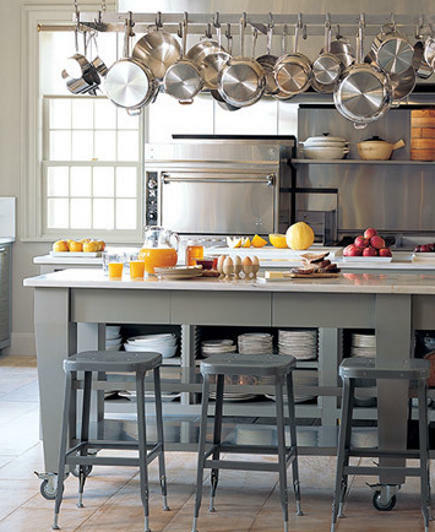 Now, half a decade later, gray has overtaken the all-white or black-and-white “Something’s Gotta Give” movie kitchen that caused such a sensation in 2003. One thing that continues to push gray forward after all this time is the wide range of tones — from light to dark. What’s more, stainless steel – the default appliance finish — fits right in. Also highly compatible are zinc and nickel hardware finishes, poured concrete, and color veins in popular marbles like Carrara and Calacatta, so highly prized for countertops. Gray paint is another story since undertones can vary from blue to yellow to beige or green. The choice I found most successful for my own house is Farrow & Ball’s Pavilion Gray. Martha Stewart’s own BedfordGray was used in her kitchen [top] and a slightly bluer hue, Benjamin Moore’s Fieldstone Gray looks good in a Martha-derivative kitchen by a Texas decorista. 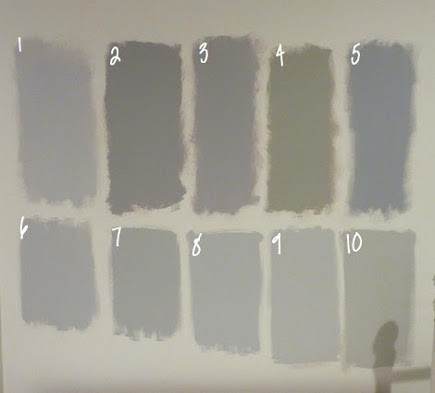 This set of Benjamin Moore gray swatches, posted by Emily from the “Name 5 Things” blog for a home office test is a great way to see undertones in ten different gray hues. Emily’s choices are: 1. Metro Gray, 2. Stormy Monday, 3. Silver Dollar, 4. Silver Fox, 5. Pigeon Gray, 6. Silver Chain, 7. Smoke Embers, 8. Stonington Gray, 9. Nimbus, 10. Revere Pewter. 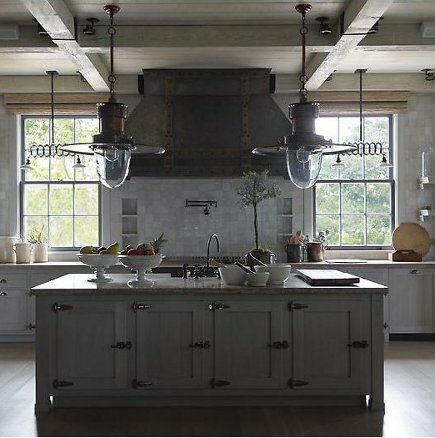 The tone-on-tone medium-gray kitchen I admire most is this one from Steven Gambrel. Its fog-on-the-beach color scheme plays off the organic color of driftwood, which is how the ceiling beams appear. Leaning to 1920s industrial in the fittings – ice box cabinet doors in the island and monster warehouse pendants overhead – there’s a coherent approach to using each material for its surface color while not letting anything get too light or too dark. For reference, a grayscale is helpful to gauge where each of these kitchens falls in the light to dark range. If I was doing a gray kitchen today, and particularly a modern one, I’d hunt down these linear porcelain tiles which mimic natural stone and mix in taupe. But I’m a taupe/greige person. What makes these perfect for any sleek look is their slim horizontality though that also could work in a transitional kitchen. And how gorgeous would these be in a master-bath shower? 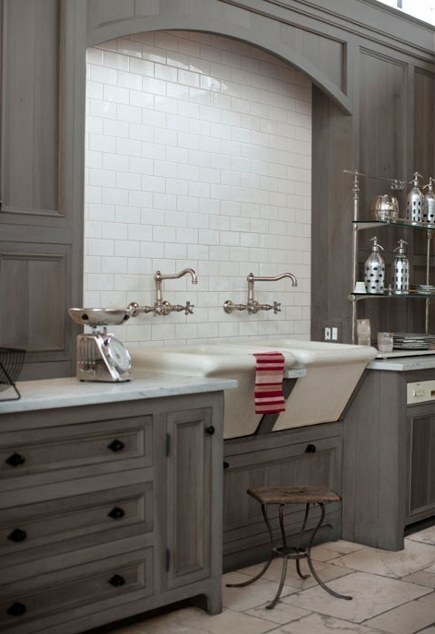 Gray-washing is my term for cabinets that have color but still allow some of the wood grain to show through. In this Atlanta loft kitchen, owned by Ballard Design’s Jill Brinson and her husband, cabinets have a gray-wash. Brinson also salvaged the stellar pair of sinks and gave them a superb focal-point installation in the white-subway niche. In a California showhouse for Veranda magazine, designer Windsor Smith did a gray and white Hollywood-size kitchen, playing off the lavish use of Calacatta marble. Comme il faut in L.A., the kitchen includes every high end appliance imaginable including a built-in French rotisserie. One quiet corner interests me more than the whole bursting burrito because it has a mini-scullery sink and dishwasher adjacent to a large plate rack backed in gray-painted beadboard and framed by a wide band of the same marble used on the sink ‘splash. According to blogland, the showhouse was purchased by actress and TV foodie Gwenyth Paltrow. 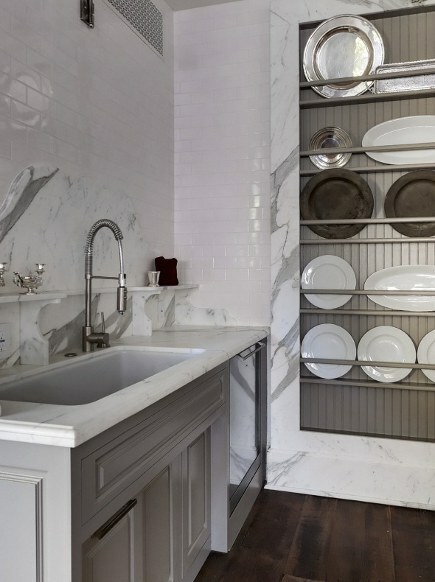 Stainless-steel drawer bases on each side of a stainless range help create a cohesive look for this dramatic wall. 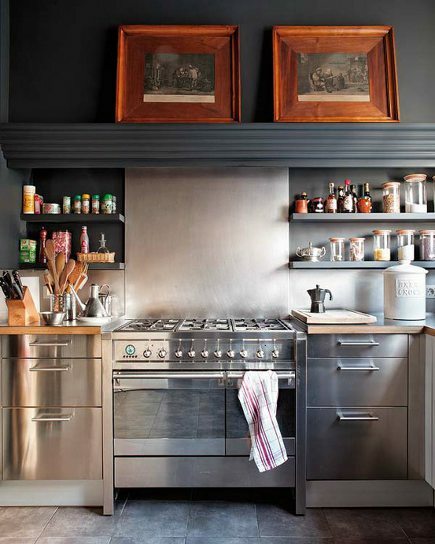 The metal is well coordinated with the floor tiles while a much darker iron-gray used in the condiment niches and carried up and over the hood ledge dominates — pulling the eye up to the two pieces of art. Such a dark mass so high up might appear top heavy with a lower ceiling but here it plays like a wow moment. 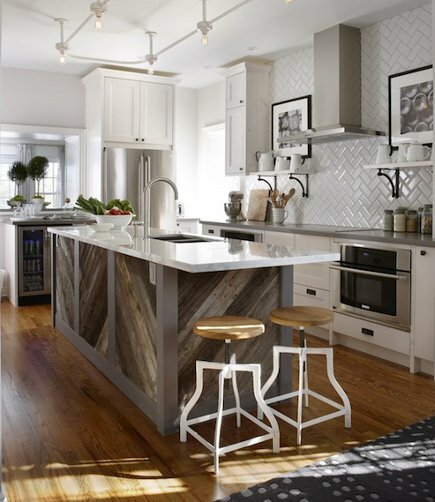 Gray weathered barn wood planks, deftly arranged like grayscale paneling on the sides and ends of the island, add tone and texture while preserving the lightness of the kitchen at eye level. Diagonal wood also references the extensive herringbone backsplash wall that uses the same-old white subway tiles but manages to make them look fresh and interesting. 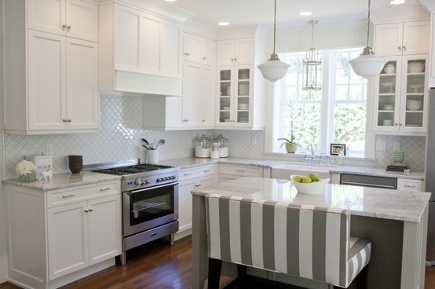 The pavilion stripe gray and white upholstery material for a bar bench seat uses stainless steel as a decorative accent color and adds bold pattern to an otherwise quiet all-white kitchen. I love gray, and have always loved gray. I’m kind of bummed it became so popular, as now the grays in my kitchen look trendy instead of just ‘me.’ Ah, well. But these are certainly gorgeous examples. The Gambrel kitchen is breathtaking. Oh I just love gray! I will use your grayscale reference for my bedroom color. However, I am planning to accentuate the area with one bold color, orange perhaps with a very minimal touch? This is just to create a little twist on the total look, so it won’t look too plain. Now, I’m really excited about it! Thanks for this wonderful tip. 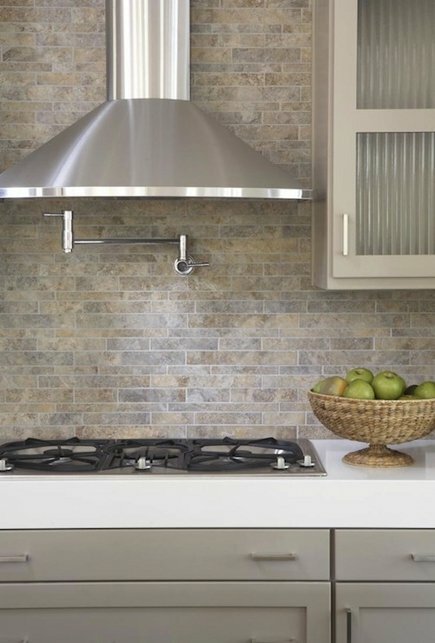 Can you tell me what the name of the tile/backsplash is? Yes, I also want to know the name/brand of the tile is? Thanks. The taupe/greige mix backsplash tiles are stone — travertine — I have these exact tiles in my transitional kitchen, which also features the benjamin moore Metro Grey and Stormy Monday pain colours on the walls, and white cabinets/doors mixed with a contrasting island in Portobello Mushroom.